The Windmilers website now has its own domain name. Please go to www.windmilers.org.uk/forthcom.htm. Please alter your bookmark if necessary. This old version of the page will not be updated after 20 November 1998. 5 Sat: Christmas Dinner Dance, Royal Oak, 90 Coombe Road, New Malden. 19.30 for 20.00. Tickets �. Four-course dinner, dancing to a disco, visit from Father Christmas and the Fairy Godmother. SORRY - NOW SOLD OUT! 18 Sun: London Marathon, Greenwich. 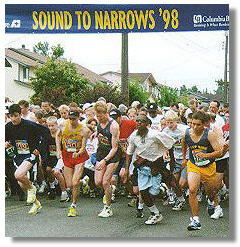 The 1999 London Marathon will take place on Sunday 18 April 1999. Applications are now closed, though you might still be able to enter through your club or via a charity (try Get Kids Going!). Organized by The London Marathon Ltd., 0171-928 8844; 0171-620 4117. Intending entrants from outside the UK should telephone +44 161 703 8161, or write to Vince Regan, Flora London Marathon 1999, Sports Tours International, 91 Walkden Road, Manchester M28 5DQ, United Kingdom. MABAC fixtures are held jointly with other running clubs in our area. This is a series of eleven Sunday morning races throughout the year, particularly aimed at the fun runner. Points are gained by every Windmiler who completes the course. The clubs in the league take turns to act as host. These are very popular cross-country events, open to all members and guests, held in some beautiful parts of the Surrey countryside. As well as the senior race of just over 8 km / 5 miles they include joggers' and junior events of about 4 km / 2.5 miles. (The Windsor and Cranleigh races are different -- longer, and on roads.) Runners have been known to find a pub for a drink afterwards. To take part, either make your way directly to the venue (maps available on this website, or from committee members), or turn up at the Windmill car park at around 09.15 for directions, or to get a lift. Running numbers will be given out at the event itself. Reebok Surrey Cross-Country League - We are in Division 4 of the League. Any number of runners can enter, but only the first 10 from each club in the men's and the first 5 in the women's will score. All club members are welcome to run. The races are about five miles (8 km), at 15.00 on certain Saturday afternoons. Contact team managers for further details. Share transport: meet at Raynes Park (opp. Durham Road), 13.30. Surrey Road League - Open to all club members, but only the first 3 men and first 3 women from each club will score. Contact team managers for details. National Cross-Country Championships - Teams have to be submitted in advance, and entries must go through your team manager. These bouncing letters come from the Animation Factory - thanks! If you're new to jogging/running, find out how to get started with Windmilers coach Wen Seear. Check out our links to other running-related sites!